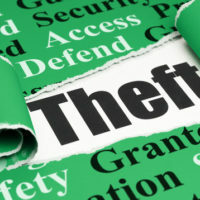 Petit theft is defined as the theft of property valued at less than $300 with the intention of permanently or temporarily depriving the rightful owner of that item. In other words, it does not matter if you intend to return an item taken for your own benefit – “borrowing” another person’s property without his or her consent is an act of petit theft if the item is worth less than $300. In most cases, petit theft is a misdemeanor charge. How an alleged act of petit theft is charged depends on the value of the item and the accused individual’s criminal record. For a first time offense involving stolen property worth less than $100, the individual may face a second degree misdemeanor charge. For a first time offense involving property worth between $100 and $300, the individual may face a first degree misdemeanor charge. When the individual accused of committing petit theft has a criminal record that includes two or more previous petit theft convictions, he or she can face a third degree felony charge. In a case like this, the value of the property allegedly stolen does not matter. If you have been charged with any type of theft offense, start working on your case’s defense strategy as soon as possible. For a third degree felony, up to five years imprisonment. An individual convicted of petit theft can face other penalties as well. An individual can face a $500 fine for a second degree misdemeanor conviction, a $1,000 fine for a first degree misdemeanor conviction, and a fine of up to $5,000 for a third degree felony conviction. The defendant can also face a driver’s license suspension for up to six months for a first time misdemeanor conviction and will have his or her driver’s license suspended for one year as punishment for a second time misdemeanor conviction. Is Shoplifting a Petit Theft Offense? When many think of a petit theft offense, they think of shoplifting. If the item shoplifted was worth less than $300, it certainly falls within the realm of petit theft. It is not uncommon for individuals to think of shoplifting as somehow “lesser” than other theft offenses, but the truth is that it can result in the same penalties that other theft convictions garner. If you have been accused of committing any type of theft offense, start working with an experienced Miami criminal defense lawyer as soon as possible to start building your case’s defense strategy. Contact our team at Ratzan & Faccidomo, LLC today to schedule your initial consultation in our office, during which we can analyze the details of your case to help you determine the most effective defense strategy for your case.